Blair Schrader may the newest member on the Marine Industries Association of Palm Beach County Board of Directors, but he is not new to doing business with marine interests in Palm Beach County. In fact, his family’s business, E.J. 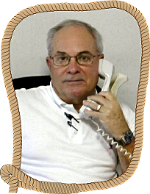 Schrader Mattress Company, was started in Downtown West Palm Beach by his father in 1956 and has been providing custom-designed and manufactured mattresses to boaters for the past 50+ years. Creating custom bedding for boats includes creating a template for each specific mattress, and then designing it according to the firmness and style that the customer chooses, he said. Additional custom design features include hinged mattresses to provide access for under-bed storage areas and hidden compartments for jewelry and other valuables. Visit Blair and Diane in Booth #571 at the Palm Beach International Boat Show March 26th thru March 30th on West Palm Beach’s waterfront, downtown on Flagler Drive.